Compiled by award-winning author Maxine Beneba Clarke, with curatorial assistance from writers Ahmed Yussuf and Magan Magan, this anthology brings together the regions of Africa, and the African diaspora, from the Caribbean to the Americas. Told with passion, power, and poise, these are the stories of African-diaspora Australians: diverse, engaging, hopeful and heartfelt. Read an extract from Growing Up African in Australia here. 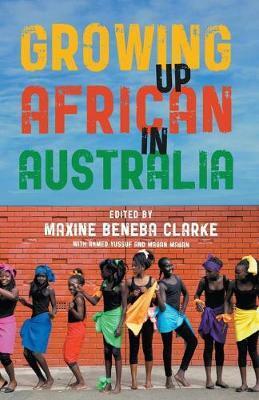 In her introduction to Growing Up African in Australia, Maxine Beneba Clarke sets the scene for an anthology of great specificity. As she explains, this is an anthology that ‘would be an African diaspora anthology’, an anthology that acknowledges the interconnectedness of the colonial project in Australia and the 400 year slave trade that supported and fed this project across the world. From this starting point of calling for submissions from African Australians across the diaspora, Beneba Clarke, and fellow editors Ahmed Yussuf and Magan Magan, weave a complex tapestry of stories specific in every thread and illuminating as a whole. Growing Up African in Australia is organised in six sections that spread across the Australian continent and the African diaspora, telling stories of place and displacement, of belonging and othering, of finding home. What is common to the contributions is that identity as both African and Australian is questioned, is othered. The underlying premise of this wonderful anthology and the other anthologies in the range, Growing Up Asian in Australia and Growing Up Aboriginal in Australia is that there is still an ‘Australian’ to be othered from. However, in reading Growing Up African in Australia, while aware of the ties to other anthologies, what I felt was the richness and diversity of the experience of people from a vast continent multiplied in size and experience by the creation of a global diaspora and then relocated to another vast continent that is still grappling with its own diversity. The first section is entitled ‘Roots’, a title that feels common to all. The final section is titled ‘Dhaqan Celis,’ a title specific to Somali. As Magan Magan explains it, ‘Dhaqan’ (meaning culture) and ‘Celis’ (return) is used to ‘describe Somali kids who have somehow lost their culture or failed to carry their culture, kids who need to return “home” …’ This is where the wonderful strength of this anthology lies, in the general and specific, in the easily understood and the never imagined.